Perspectives, perceptions and potential permutations: these have been some of the driving motivations for many visual artists since the dawn of time. And the current special exhibitions at STPI and the National Gallery Singapore hammer this home to the very core: they are still very much the crucial seedbeds for boundless ever-changing artistic creativity. For over 60 years David Hockney’s fascination with how we see and how we depict has motivated his diverse experimentation with media, methods and styles in drawing us into his celebrated portrayal of people and places he holds ever so dearly; seducing us into roving our eyes over every illustrated intimate detail from first this angle, then another and yet another. All carefully crafted by an art form that insistently refuses to bow down to the photograph’s persistent single point of view, through cues from finitely simple fluidly dynamic lines to the distorted representation of figurative subject matter to cubist-inspired collaging of his synesthetic employment of objects with a kaleidoscope of colours to energetically extending those rainbow hues and thus his artworks onto their picture frames. Showcasing all this and more are STPI’s display of Hockney’s prints collected by the Singapore Art Museum; drawing us onto the perceptual journey this world-renowned British artist took over the decades to develop the oeuvre that made him Britain’s most celebrated living artist – an eye-opening trek with which we can then cast our thus acquired multi-lensed gaze at his 2014 photographic drawing of “4 Blue Stools” with the definite dawning of insightful Eureka! 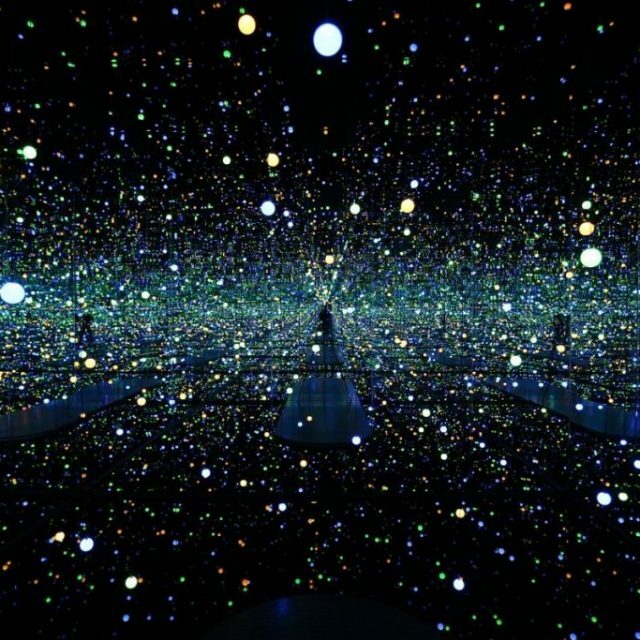 Another historical expedition worth taking is that through Yayoi Kusama’s own 6 decades of equally expansive riots of colours cutting her correspondingly diverse use of media; persuasively giving us impetus to confidently draw from our own innermost psyches. Taking New York by storm with her first exhibition of “Infinity Nets” paintings in 1957, the Japan-born and bred art maker was emboldened by the earth shattering sensation her tight composition of endless polka dots of paint had stirred to move her psychotic view of her world from a flat static 2D medium to the vibrantly brisk, bouncy and interactive installations. Her infinity mirror rooms immerse us into a magical sensory exploration of delightfully walking through the transformative celestial multiply reflected repetition of her dot paintings; a captivation she innovatively repeats with “The Spirits of the Pumpkins Descended into the Heavens” – a continuous wall to floor to ceiling manifold mirroring of her distinctive yellow-and-black whimsical bulbous gigantic pumpkin sculptures, encapsulating us in a hilarious expansive 3D area infinitively dominated by one of her most beloved motifs. At the same time, these very hallucinations of dots covering objects and space she sees to the point of matter’s self-obliteration Kusama winsomely installs into her “With All My Love For The Tulips, I Pray Forever”, where clean white walls, along with floor and ceiling, and as purely white gigantic tulip sculptures merge into a Wizard of Oz-like seamless somewhere over the rainbow destination with inhabitants enjoying equal status with their environment through being giggly plastered by large summery hued polka dots; translating the funny side she obviously gets from her psychotic episodes. In contrast to artistic big wigs Hockney’s and Kusama’s exhibitions, National Gallery Singapore’s other special show highlights the absolute plausibility of taking an age old technique like lacquer painting and evolving it to the state of the art tunes with the times: moving from the centuries old pragmatics of making the surface of everyday household objects hard and impermeable to it being widely used as a figurative painting medium of the Vietnamese people, landscapes and folklore on a baseboard from the 1930s, as epitomized by Nguyen Gia Tri’s “The Fairies”, to the contemporary art as beautifully created by up and coming Vietnamese American artist Phi Phi Oanh. While Oanh still faithfully laboriously layers, sands and polishes the lacquer, her “Pro Se” has abandoned trusty but out-of-fashion wood as the baseboard. Using sheets of heavy metal and blocks of totally transparent glass instead, she ingeniously permutated the former into iPad-like tablets of exactly the right size but lacquered with modern day images of whatever we love uploading into and Googling on with them, while the latter she uses to carry depictions of cross-sectional slices of miniscule biological entities commonly found on actual microscope slides; still carrying enough translucency for the lacquered on specimens to be projected onto white gallery walls by the light emitted by specially built slide projectors – as pointed yet playful comment on our present obsession of living in a world increasingly driven by just digital perceptions. David Hockney: “A Matter of Perspective” runs at STPI, 41 Robertson Quay, Singapore 238236 till 9 September. Yayoi Kusama: “Life Is The Heart Of A Rainbow” and “Radiant Material: A Dialogue in Vietnamese Lacquer Painting” run at National Gallery Singapore, 1 St Andrew’s Road, Singapore 178957 till 3 September.